Just a mere 16 calendar days ago I introduced you to the next modern house I will be profiling here on Life of an Architect – the KHouse Modern. Technically speaking it’s only been 12 work days since that post was written but a lot has happened. I thought the timing would be good to show some of the progress we are making on the design and drawings. My office is now 100% Revit. Some of you will know what that means, but some of you will not, so let me give a brief explanation. “Revit” is a brand name for a drafting program that we use to prepare our design and construction documentation. 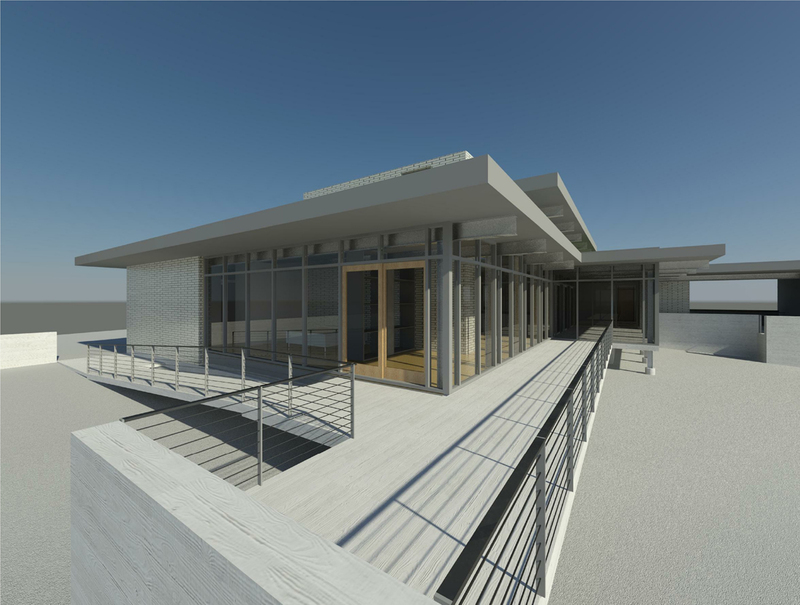 This type of drafting software is more generically referred to as Building Information Modeling – or BIM – and I believe that it’s the direction that things in the architectural world are heading. When you draw in BIM, we aren’t simply drawing lines, we are virtually building the building in 3-Dimensions. That means when we draw an exterior wall, it isn’t just two lines, it is the entire makeup of the wall – the drywall, wood studs, exterior sheathing, vapor barrier, and exterior cladding material (like stone or brick). I’m not going to make this a post on Revit specifically but it does figure in heavily in how we now go about our business. 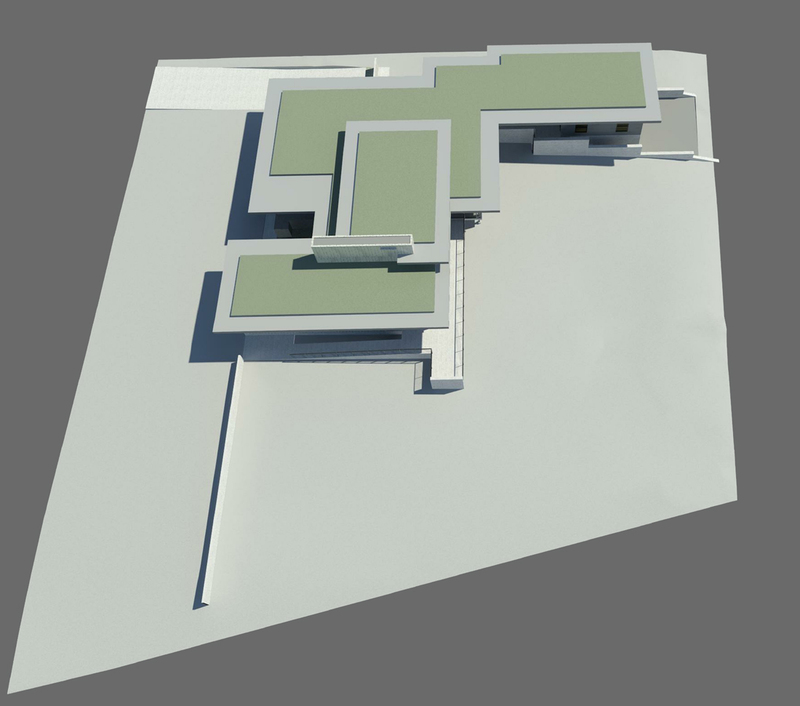 The image above is an aerial view of the site for the KHouse Modern. This house is well sized at 2,500 square feet air-conditioned and sits on a 16,000 square foot lot that slopes down from the street about 8 feet towards the rear property line. For the most part, this is a one-story residence, but there is a small 2-story section where we slid a 2-car garage under a guest suite at the rear of the property to take advantage of the grade change. 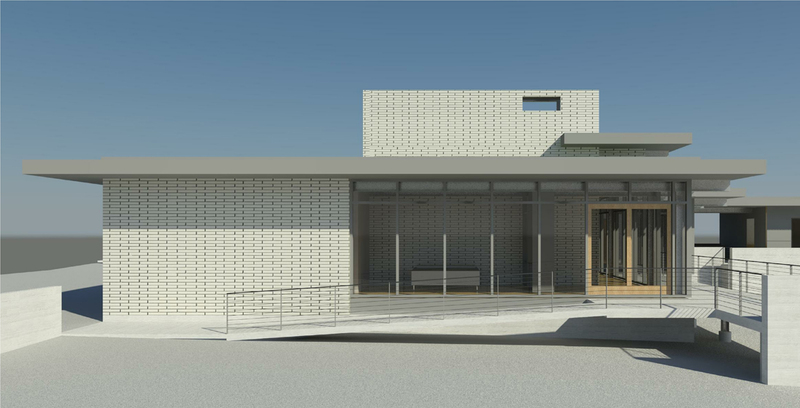 All of these images are directly outputted from Revit – and there is no faking what we haven’t drawn and what we haven’t designed. This is something new for me to acclimate to because there is no “we’ll get to that later” … when you draw a window in the plan view, it shows up in the elevation view. Good-bye Placeholders … I kind of loved you. We are also planning on pursuing LEED for Homes Certification – which would explain why the roof on this house appears to be green. This is a “vegetative roof” and the pattern of the roof follows the line of the building line below. The image above is an aerial perspective of the front elevation. The mass you see on the left-hand side is a detached garage that will act as the owners main entry. Our client for this house made a point that was very reasonable during the programming phase where he requested that his entry sequence to the house be the same as his guests. No coming in through a mud room or some rear garage the dumps you off by the utility room – nope. He wanted to walk in the front door. It also helps support our LEED goals by having the garage detached from the main house. There are generous seating areas by both points of entrance … plenty of room to take a load off and remove your shoes prior to entering the house. We created all the renderings of the project I am using in today’s post YESTERDAY! 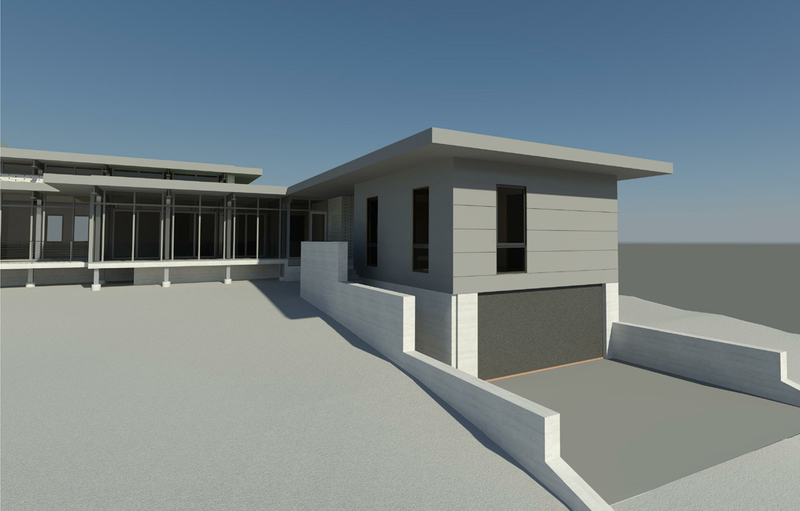 Since the process of using Revit is that the house is being created in 3-dimension, there wasn’t any special work we needed to do to create these perspectives. There are a lot of things we could have done to these perspectives but I thought it would be more interesting to see – the good and the bad – what you can get without having to export the file into a different rendering program. The materials indicated here aren’t entirely correct – the brick is still brick but things like the actual color of the brick and mortar isn’t quite right. If you look at the image above, you will see a ramp that leads up to a door that looks like wood. It’s not supposed to be wood, it’s a metal door but for some reason, the program is busting our chops and something isn’t coming out right. Here’s another look at the wood door that isn’t supposed to be wood [sigh]. This house is being designed so that the owner can live here and “age in place”. We are paying attention to how the house will work as he gets older and when the possibility increases that he might not get around as well as he used to (years from now). I am walking you around the house with the images we’ve prepared – hopefully that’s obvious by now. In the picture above, the lowest part of the picture is a large outdoor seating area that is elevated above the downward sloping site. We still need to design the bench and the handrails but you get the idea. At the far end of the elevated terrace is an “exterior room”. This space is outside the air-conditioned building footprint but is under roof and wrapped in hardware cloth to keep the bugs out. This space is directly across from the kitchen and there are sliding doors all along this rear window wall. These sliding doors will allow the owner to open the house up, take advantage of the cross breeze, but not have to worry about letting in the mosquitos. In the image above, we’re standing towards the rear of the property looking back and up at the main house. On the right-hand side of the image is the 2nd garage (future bonus room) on the lower level with a guest suite above. There is an outdoor cooking area between the guest suite and the screened in porch – don’t really have a good view of that area since we haven’t fully modeled it yet. This final view is of the second garage and the guest suite. There is a board-formed concrete retaining wall that is currently shielding a set of stairs from your view. In case you’re wondering – no – the retaining wall will NOT look like how it is shown in this rendering. This is an example of what happens when you draw the retaining wall in plan and have to deal – right then – with how it will be shaped vertically. This retaining wall hasn’t been designed yet so the wall “stair-steps” down the site just so the client wouldn’t look at this image and wonder why he now has a loading dock at the rear of his property. 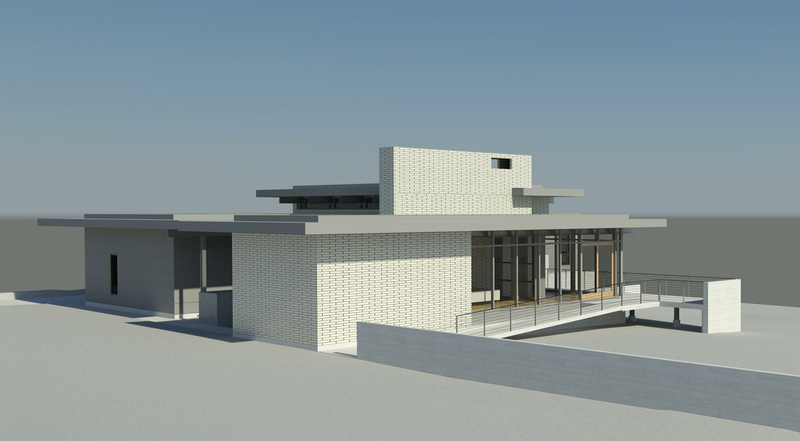 I am endeavoring to learn Revit and it has been illuminating to see how the house has been coming together. This process has already challenged my way of thinking about how you put a set of construction drawings together on a residential project. The end product will still hold to my high standards the journey of how we get there will be different. There have been times when the software really demonstrates its power (inserting and sizing windows into walls is ridiculously easy) but there have been just as many times when the software has driven me mad (like trying to get the metal siding that clads the garages to actually read as metal siding). So far, I have to admit this learning process has been extremely rewarding … for 16 days. Thanks to Ryan in the office for doing most of the heavy lifting, I’m still at the stage where I point at the screen and say “move that over there”.